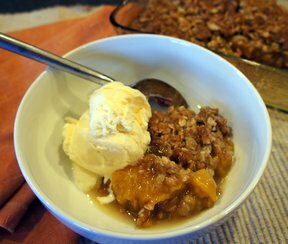 Nothing warms up your house than with a fruit crisp in the oven. Why not try one tonight? 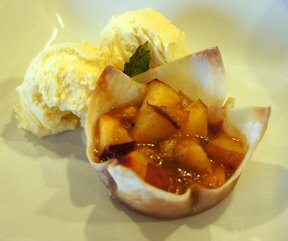 Surprise someone with this warm dessert and serve it with a large scoop of ice cream. You can use peaches, apples or plums. 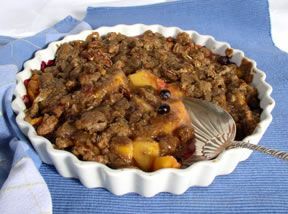 Place fruit an sugar in a baking dish; stir to combine. For topping, combine oats, brown sugar and flour in a bowl. Cut in butter until mixture resembles course crumbs. Add nuts, if desired. Sprinkle topping over fruit. 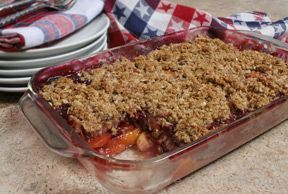 Bake in a 375° oven for 30-35 minutes or until fruit is tender and topping is golden. "This was so easy! I even used a can of peaches, drained the juice and skipped the sugar. The topping was the perfect crisp topping! I might add a little cinnamon to it just to warm it up even more."